Sebastian Vettel set the pace in final Formula 1 practice for the Monaco Grand Prix, edging out Lewis Hamilton by just 0.018 seconds. 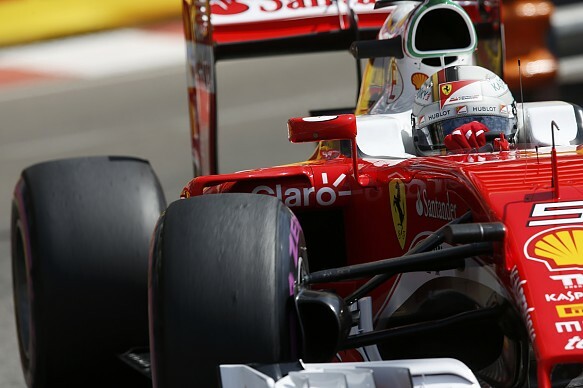 Ferrari driver Vettel clocked a 1m14.650s on the ultra-soft tire to head a top four covered by only 0.157s. Hamilton was on course to go quickest, having set the fastest first and second sector times, but he encountered traffic in the final few corners. It was an improved showing from Mercedes, which conceded it had homework to do after being outpaced by Red Bull on Thursday. Nico Rosberg was third fastest, 0.122s off the pace, with Daniel Ricciardo fourth and his teammate Max Verstappen fifth. Verstappen hit the barrier at Massenet late on, understeering wide as he came over the crest and locking up before sliding into the barrier. He returned to the pits with suspension damage and his Red Bull team did an impressive job to get him back out for a run at the end of the session. Toro Rosso’s Daniil Kvyat was a promising seventh, edging his teammate Carlos Sainz Jr. by 0.065s. Kimi Raikkonen had a poor first sector on his qualifying simulation and ended up ninth, 0.905s adrift of his pace-setting Ferrari teammate Vettel. Sergio Perez was eighth with his Force India teammate Nico Hulkenberg completing the top 10. Williams continued its struggles in Monte Carlo. Felipe Massa was a low-key 11th and teammate Valtteri Bottas 14th. Fernando Alonso was the leading McLaren in 12th, 0.041s quicker than teammate Jenson Button. Renault faced repair work for the third successive session as Jolyon Palmer glanced the barrier when he spun in the first part of the Swimming Pool complex in the opening minutes.